Maximize CPU to GPU parallelization by generating render commands on the GPU. This sample app demonstrates how to use indirect command buffers (ICB) to issue rendering instructions from the GPU. When you have a rendering algorithm that runs in a compute kernel, use ICBs to generate draw calls based on your algorithm’s results. This sample app uses a compute kernel to cull invisible objects from its rendering submission, thereby generating draw commands for only the objects that are currently visible in the scene. The Encoding Indirect Command Buffers on the CPU sample code introduces ICBs by creating a single ICB to reuse its commands every frame. So, while the former sample saved expensive command encoding time by reusing commands, this sample uses ICBs to effect a GPU-driven rendering pipeline. 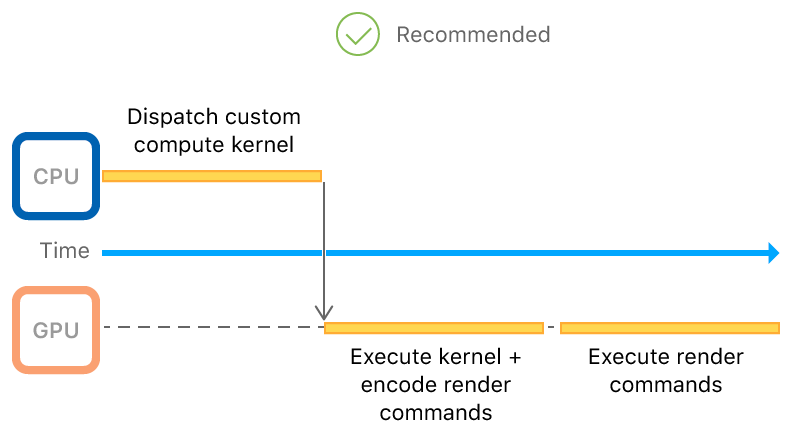 Ideally, you store each mesh in its own buffer but on iOS, kernels running on the GPU are limited to a small number of data buffers they can access per execution. To reduce the number of buffers needed during the ICBs execution, you pack all meshes into a single buffer at varying offsets. Then, use another buffer to store the offset and size of each mesh. The process to do this follows. // Choose the parameters to generate a mesh so that each one is unique. // Create a vertex buffer and initialize it with a unique 2D gear mesh. // Store the mesh metadata in the `params` buffer. // Pack the current mesh data in the combined vertex buffer. // Set the other culling and mesh rendering parameters. // Set the position of each object to a unique space in a grid. // Check whether the object at 'objectIndex' is visible and set draw parameters if so. //  Otherwise, reset the command so that nothing is done. // Set the bounding radius in view space. // Check if the object's bounding circle has moved outside of the view bounds. // Get an indirect render commnd object from the ICB given the object's unique index. // Set the buffers and add draw command. // Generate an empty command so that the GPU doesn't draw this object. The parallel nature of the GPU partitions the compute task for you, resulting in multiple offscreen meshes getting culled concurrently. // This is the argument buffer that contains the ICB. This sample optimizes because redundant state results from the kernel setting a buffer for each draw, and encoding empty commands for each invisible object. Optimizing out the empty commands frees up a significant number of blank spaces in the command buffer that Metal would otherwise spend time skipping at runtime. If you optimize an indirect command buffer, you won’t be able to call executeCommandsInBuffer:withRange: with a range that starts in the optimized region. Instead, specify a range that starts at the beginning of the optimized region and finishes at the end or within the optimized region. While you can encode an ICB’s commands in a compute kernel, you call executeCommandsInBuffer from your host app to encode a single command that contains all of the commands the compute kernel encoded. By doing this, you choose the queue and buffer that the ICB’s commands go into. The time that you call executeIndirectCommandBuffer determines the placement of the ICB’s commands among any other commands you may also encode in the same buffer. Reduce CPU overhead and simplify your command execution by reusing commands. A container that stores commands that are encoded either on the CPU or on the GPU. An object that configures new MTLIndirectCommandBuffer objects. An interface that specifies indirect render commands encoded with the CPU. The types of commands that can be performed indirectly.